Summertime from June to August is the most typical time to go due to the great weather, though going during the off season will save you a significant amount money while still offering plenty of activities to do and see. If you want to experience Icelandic Pride, then you’ll definitely want to go in August. Reykjavik Pride takes places in the island country’s capital of Reykjavik from August 8th to 13th, 2017. It accurately calls itself one of the largest small prides in the world. As one of the country’s largest annual events, it attracts up to one hundred thousand attendees every year. The six day event includes a semi-formal opening ceremony (where we got to see Willam from Rupaul’s Drag Race perform in 2014! ), movie screenings, drag and musical performances, guest speakers, an outdoor parade (of course!) and closes out with the Pride Ball. It’s definitely a pride like you’ve never been to before and one of our favorites! Iceland is a country of opposites – cold weather and warm people, sunny summers and dark winters, adventure activities and relaxing springs – providing a balanced travel experience. Doing a glacier walk is a great activity for adventure seekers and doesn’t require any special skills. It’s an incredible experience to be up close to the huge chunks of ice that form parts of Iceland’s landscape. You can balance your active side with your restful side my checking out the infamous Blue Lagoon. This geothermal spa is a man-made wonder rich in minerals and the warm water is perfect for relaxing and bathing. This popular tourist route is known for its three main sites including the Gullfoss waterfall, the Great Geysir and Þingvellir National Park. We did this tour during our trip to Iceland a few years ago and enjoyed all three, especially the waterfall. In fact, David’s selfie there has shamelessly been his Facebook profile picture for over two years now. But hey, a good photo’s a good photo! The Great Geysir doesn’t erupt nearly as much as the Strokkur geysir nearby which does so every few minutes, guaranteeing you a show. Lastly, Þingvellir National Park is one of Iceland’s most important historical sites as the location of the world’s first democratic parliment in 930 AD. 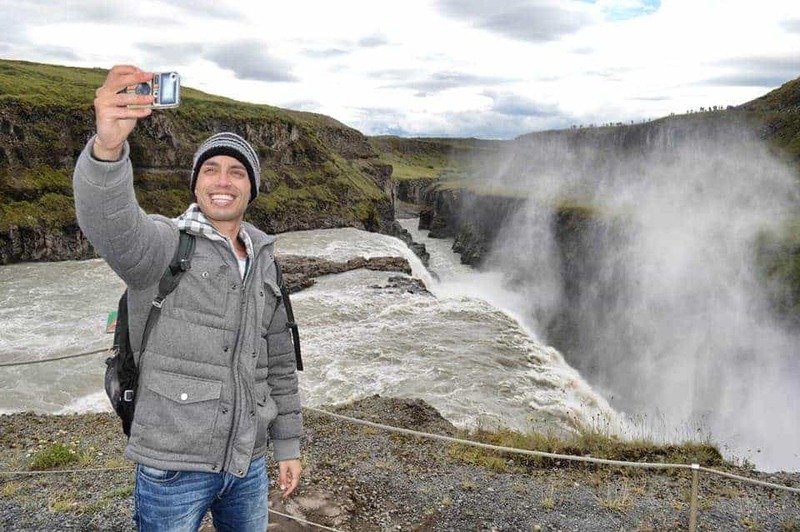 Our friends at Out Adventures have prepared an 8 day Iceland Pride Adventure itinerary to help gay travelers experience all the best parts of Iceland. We had an amazing time when we visited Iceland a few years ago and got to do everything we’ve mentioned. It’s truly a one of a kind destination which allows you to be adventurous as well as relax while taking in Iceland’s beautiful landscape. Plus spending a few days in the vibrant capital city of Reykjavik adds a touch of quaint city life to the experience. We did it all during Reykjavik Pride too which was great getting to meet other LGBT travelers (who we still keep in touch with today) in Iceland to share the moments with. Pride here is just as special as the country and people that organize it. Special offer! Save up to $200 on the OUT Adventures Iceland trip when booking online. Click here to get your special discount. If you’re interested in traveling with Out Adventures and meeting other gay travelers while touring Iceland, check out their group tour that ends with Reykjavik Pride August 6th – 13th, 2017. All tours, accommodations, and entrances to the sites are included plus the Pride brunch and Pride closing party. We look forward to seeing everyone’s fun on social media this August! And don’t forget, you can even save up to $200 on the OUT Adventures Iceland trip when booking online. Click here to get your special discount. What interests you most about visiting Iceland?